These are the most pigmented blushes I have come across in my life! The pigmentation is out of control. A slight touch of the blush brush and you have enough for both cheeks. I must admit the first time I used one of these blushes I looked like a clown. I really had very rosy clown cheeks. I just used a little and boy did it go a long way. So now I do the smallest tap into these blushes and thats enough for me! In fact I use a stippling brush when I can because you can get over-blushed in no time with these babies! 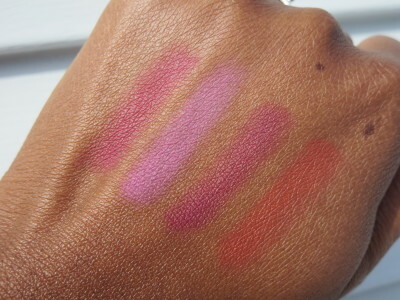 I picked up four shades during a Coastal Scents sale. I got my four blushes for $4.77 each! The Forever Blush collection is huge. There are eighteen colors in all so there is something for everyone. I just picked four I thought that I’d like and I’m really happy with the outcome. These blushes would take a lifetime to use up. They are so pigmented I think it would take forever to hit pan on one. 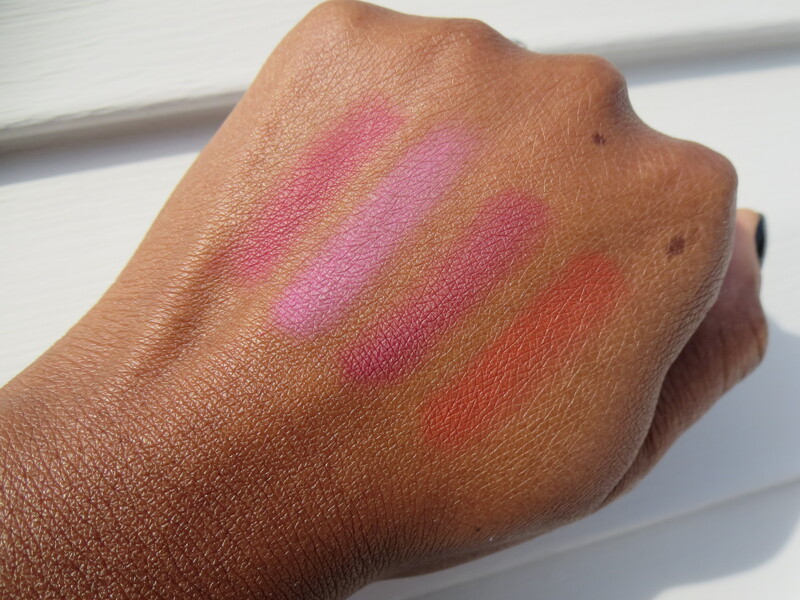 Let’s look at some swatches! If you are of a lighter skin tone be super careful with these blushes from Coastal Scents. There are lighter shades available though so don’t be scared! I tend to choose bold colors but there are lighter ones available in this large collection. My favorites out of the four are Passionate and Radiant. 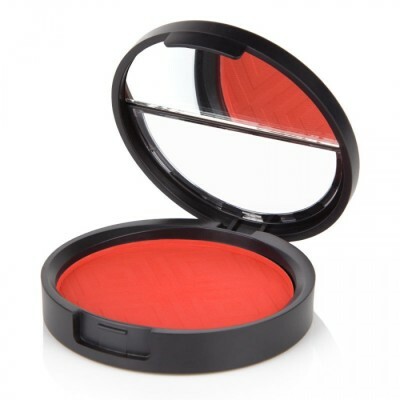 I love the deep berry goodness of Passionate and Radiant is an amazing orange blush. I highly recommend trying this or any orange blush for deeper skin tones! Alluring is a lighter yet dark pink compared to Passionate which has an almost purple berry tone to it. So don’t count that one out either! 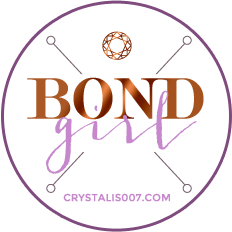 If you are more fair and in need of a super pretty pink then check out Enchanting. It’s the perfect Barbie pink blush. Have you picked up one of these Forever Blushes yet? If so please let us know your thoughts! I love these blushes!! I picked up four as well when they were having 50% off sale on the blushes last week. I have Alluring, Passionate, Radiant, and Exquisite. Thinking about adding two more. Passionate is my favorite of the four followed by Radiant. I hope Coastal Scents adds more colors to the forever blush line. Wow what a great deal! Thanks for letting us know you love them! Come to meeeeeee! I wish they has color descriptions of the blushes on their site. The 4 you picked up are smack dab in my happy place. Me too I think I am good as far as colors right now but I’d love some color descriptions just to make sure I got everything I need! I got a four of these a few weeks ago and am in love (need to feed my blush obsession). Serious pigmentation and they are absolutely gorgeous. How is the staying power?? I adore a pigmented blush, but I typrically apply my makeup at about 645am so I need something that goes the distance! Or at least until lunch ha. This blush didn’t move or disappear on me! My cheeks usually “eat” blush so the fact none of these blushes moved or went missing is appreciated! I’d like to know your thoughts on how they compare to Sleek or La Femme blushes. If you are new to makeup, want something mostly good proof, and not good with blush in general I’d say stay away from these. Sleek and La Femme are great inexpensive blushes that work really well. But if you have patience, aren’t afraid of a little bit of a learning curve at the beginning and your blush disappears during the day Forever Blush is worth trying. I bought the complete set when they had their 50% off sale. They are truly pigmented! since I have so much, I was trying to depot them and put them into a palette but they are like permanently stuck to their packaging. I was wondering if any one knows how to get them out.